Mammoet is deploying nine crawler cranes to complete the terminal project. A leading player in the region’s construction sector, Limak Insaat is constructing the terminal for Kuwait’s Ministry of Public Works. The state-of-the-art terminal will significantly increase the capacity of the airport and establish a new regional air hub in the Gulf region, says Mammoet. Replacing the existing terminal, this world-class building will increase passenger capacity to 25 million per year, it added. Designed to provide the highest level of passenger comfort, the terminal has a trefoil plan, comprising three symmetrical wings of departure gates. Each facade spans 1.2 km and all extend from a 25-m-high central space. Mammoet will install all precast sections of the terminal’s main structure, which consists of 804 concrete elements each weighing between 200 and 360 tonnes. 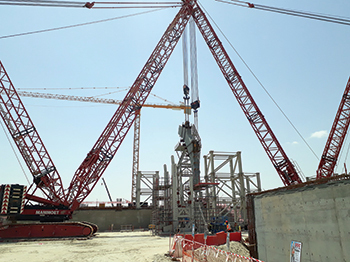 To complete the project, Mammoet will deploy nine crawler cranes ranging in capacity from 600 to 1,600 tonnes and 72 axle lines of self-propelled modular transporters (SPMTs). Mammoet’s project manager Andrew Hefft points out that early involvement of a heavy lifting specialist is key to projects of such a large scale. “On this project, we were able to offer our engineering input and advice on the selection of the right equipment to increase the overall efficiency of the project,” states Hefft. “Our client was able to fine-tune and adapt the initial strategy to optimise the entire construction approach,” he adds.